Went to the Victoria and Albert museum in the afternoon. Thai (purple!) curry for dinner in the evening. Erika came to visit me at my office after work, then curry for dinner. Built a bridge with Erika in the morning. In the evening oddly ate dinner in the corridor. South of the river again for anohter birthday party. We were invited down to Balham for Kai's 1st birthday party this afternoon. It was very kind of Kai's Mum to invite us along as Chie only really knows her through continuously bumping into her in the street (until recently they lived round the corner from us), and at some point they'd got chatting as Mums do. It was a very lively party - it was Hawaiian themed and the majority of the guests were either Italian or Brazilian. Interesting to contrast with the very English party we had for Erika! Also this morning I rather unusually baked some bread, so we had an entirely home made lunch before we went to the party. It was a rather lovely feeling to see Erika apparently enjoying my bread and soup (the soup was actually quite nice, the bread was very amateurish). I thought I'd try taking a couple of black and white pictures of Erika for a change. Just a few random pictures. 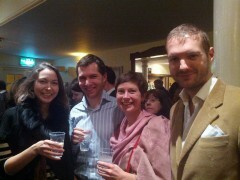 Went down to Richmond with Al, Kyle, Charlotte and Hannah to see the new Jeeves and Wooster play. Erika seemed to be a bit better today, but still to be on the safe side we thought it best to mostly keep her indoors in the warm. I popped out for a bit in the later afternoon, while Chie took Erika to the library, and treated myself to a quick glug of perry at the Harp then did a spot of shopping. I went to the new Japan Centre (it's a bit small and dingy compared to the old one) and bought sushi for dinner. Took Erika to the doctor in the morning - her surgery runs a walk-in clinic at the weekend which is very convenient. I'm not sure I completely understood what the doctor said, but it seemed she probably had something along the lines of a throat infection. He prescribed her some antibiotics. Whilst waiting for the prescription to be ready we did a bit of shopping at Sainsbury's, and had elevenses at the little Portuguese deli in Pimlico - a coffee and some custard tarts. I made leek and potato soup for lunch, thinking it might be nice for Erika as she was feeling poorly, but couldn't really persuade her to eat very much of it. Went out for another walk later on in the afternoon. It was grey and quite cold sort of a day, and we didn't really have much enthusiasm for being outdoors to be honest, but somehow felt we all needed the fresh air. We just went to Victoria Street, did a tiny bit of shopping, then headed home again, and took Erika for a bit of a stroll around the gardens when we got back. She seemed to have perked up a little bit this afternoon - perhaps the worst of it was already behind her. I made pesto for dinner, having received a shipment of Twineham Grange from Bookhams yesterday, which we had with some fresh pasta. Introduced Erika to Walter and Veronica, over lunch at Oliveto. The food seemed to go down rather well, although Erika wasn't really in the best of spirits, nor was Chie for that matter. She'd had quite a difficult morning with her, following on from a difficult night last night. Erika has quite a bad cough at the moment, which seems particularly bad overnight, so she's sleeping even worse than usual. I could see Chie really needed a rest so I took the afternoon off, allowing Chie to have a few hours sleep, whilst I took care of Erika. Erika really wasn't her usual bubbly self, the coughing was really bothering her, she seemed sort of lethargic and her voice (if you can call it that, since she isn't really speaking any inteligible words yet) was all hoarse. In the evening Chie went out for dinner with some of her friends, so I continued my stint as a good father/husband, tending to poor little Erika, who was really under the weather. Walter, a friend from work, was visiting London this week, but unlike previous visits this was purely a holiday. He'd also brought his wife Veronica along, I think it was her first time to come to London. They were staying at the Goring, rather impressively, so I met them there, and they invited me to their room to "help" drink a bottle of Champagne the hotel had given them, as it was in fact Walter's birthday today. It was a nice opportunity to see inside one of the rooms at the Goring, having just been to the dining room and the gardens previously. From there we headed out, and I have to admit felt a bit of a sense of pressure at the fact I was organising a night out, not just for Walter's birthday, but his 40th at that... but a pub tour seemed to be what he wanted to do, so I guess I was the right man for the job! We started with dinner at the Seven Stars. The food there is quite unique, and puts me in mind of how I imagine the fare at an 18th Century coaching inn might be like - the sort of sustenance that Dr Johnson and chums would have known. My intuition was that this would really appeal to Walter, and I think I was right - plus added into the bargain Walter and Veronica are cat lovers, and the pub has a cat. So I think this was a very good start. Walter also seemed to like the poignancy (if that's the right word for it) that we were in a pub which was (over) 400 years old on his 40th birthday - so it was ten times his age. We'd started the evening quite late, and dinner of course always takes a big chunk out of any pub tour, so after that we only had time for two more stops - I of course played it safe and went for two of my all time favourites - the Cittie of Yorke and Ye Olde Mitre. I think these went down pretty well too. Made porcini risotto for dinner this evening (jut dried porcini, nothing too exciting). Recently I've been a bit miffed by Sainsbury's having changed the ingredients for their "Italian Hard Cheese" - a Parmesan substitute which was made with a vegetarian rennet. So this meant they no longer sold any vegetarian Parmesan style cheese, which seemed like a step backwards. On the plus side I heard from them via Twitter that they'd go back to using a vegetarian rennet from next spring. I assumed from the speed of their response that other people had similarly questioned them on this issue, and felt reassured that I'm not alone. In the meantime I used some "Sussex Charmer" for tonight's porcini risotto, which apparently has borrowed some parts of the production method with Parmesan. Although a good cheese in its own right it wasn't really quite hard enough to work properly in the risotto, but I suppose the end result wasn't too bad. Chie had a seminar to go to in the morning again today, and as it wasn't too far from where Erika's nursery is, we swapped our usual roles, so that for once Chie dropped her off in the morning, and I picked her up in the evening. Picking her up is, in principle, a much nicer job, although today I was greeted by Erika wearing nothing but a nappy, as apparently she'd developed a bit of a fever. She seems to have been ill pretty much constantly since she started nursery a month-and-a-bit ago. Sigh. Just one picture of Erika standing by the gate of her play pen. Chie went off to a seminar today, but other than that nothing really to report! Headed out around 11 in the morning, in the direction of the National Gallery, where they had a "magic carpet story time" for kids which we attended. It was only 30 minutes, and essentially a guide from the gallery sits down on a carpet with a bunch of young children and talks about the painting in kid friendly terms. After that we had dim sum for lunch at Joy King Lau, which was good as always. We let Erika try a few of the dishes, she seemed to quite like cheung fun. After that we did a bit of shopping along Regent's Street - Chie bought a new dress - before heading back home, around 2:30. Just popped out again for a bit later in the afternoon to go to Sainsbury's. We'd had a bit of a problem with the water this weekend - the cold water seemed to be coming out warm (sometimes hot even) and so to be on the safe side we decided to stock up on bottle water for drinking. Also bought a copy of Country Life which I spent some of this evening reading. I mainly chose it for the unrealistic daydreaming about magnificent country houses featured on the first few pages - like most people. However I actually read it more or less cover to cover, and found it surprisingly interesting. We felt like we'd eaten quite a lot of oily food this weekend so instead of the usual roast dinner we had a light meal of salad, some Quorn fillets, and some boiled new potatoes. Mum visited London today, we met up with her just after noon at Edgware Road, and went for Syrian food for lunch, at a place called Abu Zaad. I think it's probably the first time we've had Syrian food. Some parts of it were recognisable from Lebanee food (although with interestingly different small touches - there was yoghurt in the foul medames, for example) but other things were new to me. The saj - a sort of Syrian pizza - was a particular hit. After that we got the number 2 bus back to the flat, and spent the remainder of the afternoon there. I threw together a stir fry for dinner, after which Mum headed off to get the train back up to the Midlands. Today I bore the consequences of the previous night's excess. Oh dear. Ben was briefly passing through London en route for Tokyo, and we arranged to meet up tonight to go out for cocktails. I decided to try Mark's Bar in Soho, about which I'd heard good things. At the time it just felt like we were having a quiet, pleasant conversation over a few drinks, but without realising it we actually drank rather too much, and the next day I paid for it accordingly. Oh well. Of particular note were the Heisenberg (a reference to the TV series "Breaking Bad", which was lost on me), a sort of variant on an Aviation, served in the sort of flask you'd use for chemical experiments. Also the "Shipwreck Blazer" which involved some amount of pyrotechnics. I popped out at lunchtime to get my hair cut. The last time I'd gone to look for somewhere new to try in St. James's I'd discovered Briggs, a tiny little place hidden away in one of the back streets behind Jermyn Street. It only opens Mondday to Friday, so I'd ended up going somewhere else last time, but this time round I was determined to give Briggs a go. It was a rather lovely experience - the barber, Phillip, is in his 80s, and has been running the place for half a century or more. He said a lot of his regulars are gentlemen from the St. James's clubs, a world I'm rather fascinated with. It somehow felt more traditional than any of the other St. James's barbers I've tried (and I think I've been to them all now). He didn't waste any time with tedious conversations about what "style" I wanted - it was obviously going to be a short back and sides, with a side parting. I was rather pleased with the result actually. Whilst on Jermyn Street I decided to have a quick lunch at Getti's. It wasn't bad I suppose. Continuing in the theme of the last few days, of gradually acquiring all the requisites for black tie attire, I also took the opportunity whilst on Jermyn Street to have a quick look round some of the shirt shops for evening shirts. Couldn't find anything that was quite right though. Today I also received a "proper" (i.e. self tie) bow tie in the post. It had actually taken a little while to track down a non-silk one which looked relatively decent. I then spent a large chunk of this evening annoying myself by not really being able to figure out how to tie it properly, despite watching numerous YouTube videos on the subject. I eventually figured out the basics - see picture - although I think there's still some work required to perfect it. Blimey it's October already. Q4. Am attempting to write this almost two weeks hence, and have no recollection of what I did this evening. Probably I spent at least some of it looking around on the web for evening shirts, and other accompany requisites for my black tie outfit. A picture from The Chap of Tristan Langlois in a dinner suit. I'd taken this to discuss with other people about the minutiae of black tie. Believe it or not I've never actually owned a dinner suit before, having never really been invited to the sort of occasion which would require it. So learning about all the little details, and the do's and don'ts has been rather fascinating. Spent the afternoon in Kensington, with lunch at Whole Foods, a bit of vintage clothes shopping, and a wander round Hyde Park. The particular highlight for me was a visit to Hornets, on Kensington Church Walk, where I bought a vintage dinner suit. It looks 1930s ish in stlye, but is probably somewhat later than that, maybe 50s or 60s. I got it with the upcoming Grand Anarcho Dandyist Ball in mind - the Chap Magazine's other big annual shindig - which I'm hoping to attend for the first time this year (and have managed Chie to come along to as well). Apart from the satisfaction of having found a suit which fit well so quickly, and at what I considered to be a very reasonable price, the whole atmosphere of the shop was rather wonderful - the owner was sitting outside on a low wall, with a pipe, sharing a bottle of wine with an absolutely immaculately dressed young German chap. They were having a rather intellectual discussion about history and politics, so far as I could tell. Kensington Church Walk is a rather idyllic little spot already, and I had a bit of a chat with the two chaps, who gave me lots of useful advice on evening wear.